We are pleased to share some detailed pictures (as usual, just click a picture to enlarge it) of the Luminor 1950 Tourbillon GMT Ceramica PAM 00528 "Lo Scienziato" that Officine Panerai created as a tribute to Galileo Galiei, a scientist whose discoveries had a revolutionary impact on the development of mechanical timekeeping (just consider Galileo’s formulation of the law of isochronism of the pendulum). 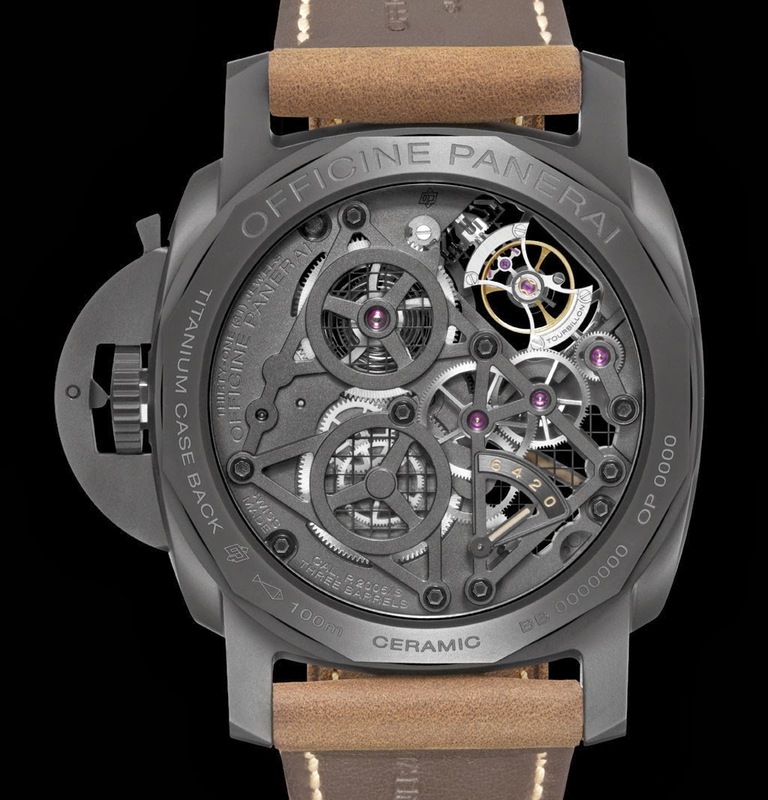 Thanks to the extensive work of skillful skeletonisation and the sapphire crystal porthole in the back, the P.2005/S hand-wound movement with tourbillon escapement, entirely developed and produced in the Officine Panerai Manufacture, is in full display and for the first time in a Luminor 1950 case. 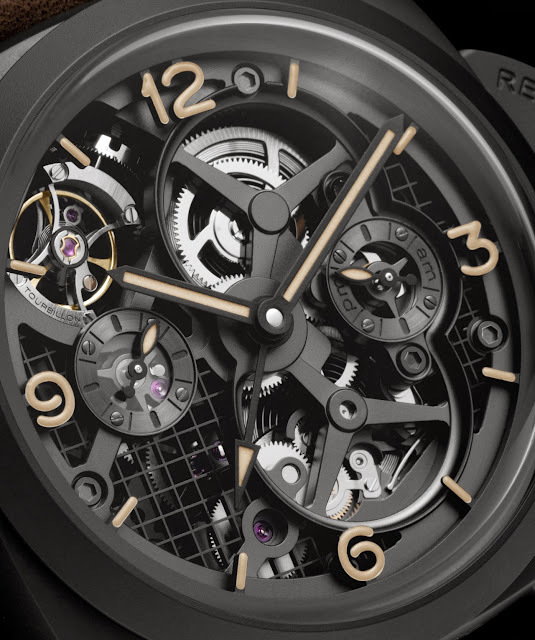 The plates, barrels and bridges have been skeletonised so that every internal detail can be seen, and most of the components have been galvanically blackened to harmonise with the colour of the 48 mm black ceramic case. 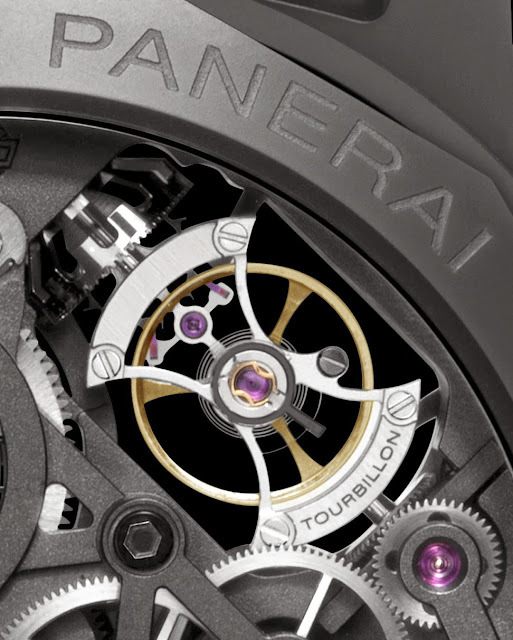 The most fascinating element of the P.2005/S calibre, both technically and visually, is the tourbillon cage which makes two rotations per minute on an axis at right angles to that of the balance, providing the best possible compensation for errors of rate caused by gravity. A small disc covered with ecru Super-LumiNova displays the rotation of the tourbillon on the dial side, making two revolutions per minute within the small seconds dial. The P.2005/S also has the second time zone function, with a central hand and day/night indication on an auxiliary dial at 3 o’clock, and the system for the rapid setting of local time, which enables the hour hand to move in jumps of one hour at a time without interfering with the movement of the minute hand or the running of the watch. 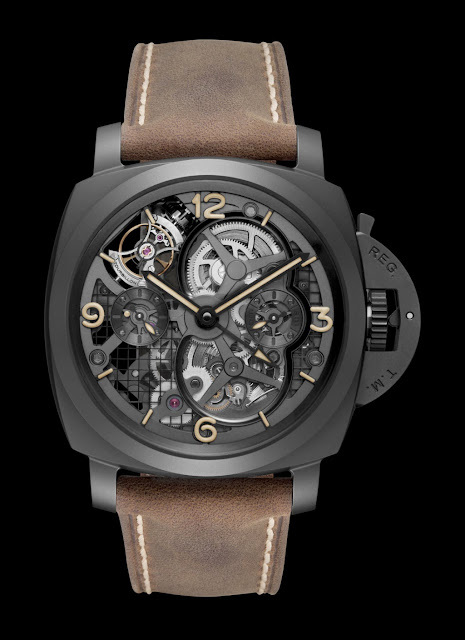 The calibre consists of 277 components and has three barrels, providing a power reserve of six days. This power reserve is indicated on the back of the movement. 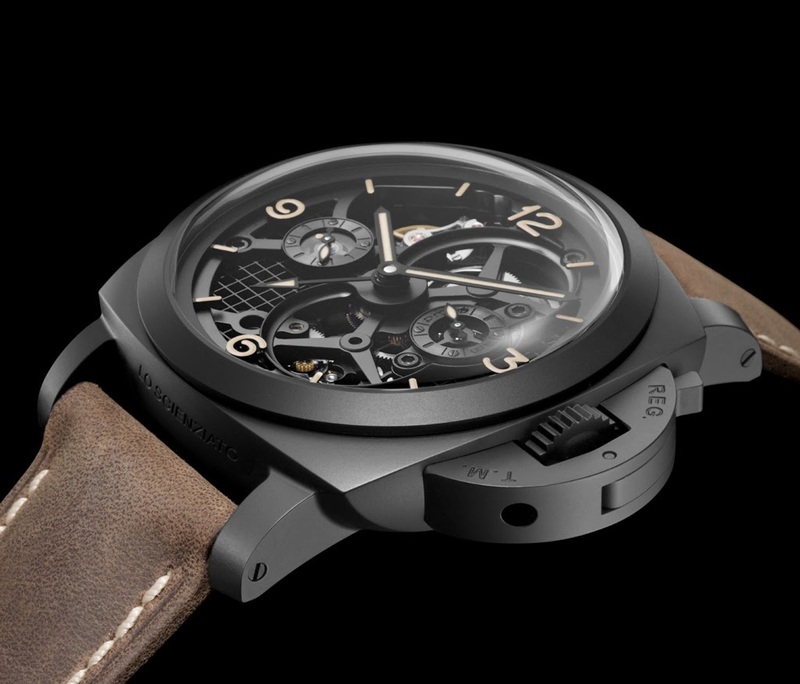 The Luminor 1950 Tourbillon GMT Ceramica "Lo Scienziato" is water-resistant to 10 atmospheres (about 100 metres) and it is supplied with a strap of natural leather, fastened by an adjustable buckle in blackened steel, and a second black leather strap. Officine Panerai created the Luminor 1950 Tourbillon GMT Ceramica PAM 00528 "Lo Scienziato" as a tribute to Galileo Galiei, a scientist whose discoveries had a revolutionary impact on the development of mechanical timekeeping.